Product #18310 | SKU BLX188/CVL | 0.0 (no ratings yet) Thanks for your rating! The BLX188/CVL Dual-Channel Dual Lavalier Wireless Mic System from Shure includes a BLX88 dual-channel wireless receiver, 2 BLX1 bodypack transmitters, 2 CVL Centraverse lavalier microphones, and 4 AA batteries. The system is set to Shure's M15 frequency band and operates between 662 - 686 MHz. The BXL1 bodypack transmitters have a 91.44 m line of sight operation range with the BLX88 receiver. They are each powered by two included AA batteries that can provide up to 14 hours of operation. The BLX88 receiver features microprocessor-controlled internal antenna diversity that helps prevent interference and signal dropouts. Its one-touch QuickScan feature detects the most interference-free frequency and sets the channel to it for fast setup. The BLX1 Bodypack Transmitter from Shure is designed for use with Shure's BLX wireless systems. It is set to the M15 frequency band and operates between 662 and 686 MHz. It has a TQG input and can be used with Shure lavalier, headset, earset and instrument microphones. With the optional WA302 adapter cable, the BLX1 can be used as a transmitter for guitar. The unit has a top panel mounted on/off switch as well as volume control for quick access while speaking or performing. The BLX1 is powered by the two included AA batteries for up to 14 hours. 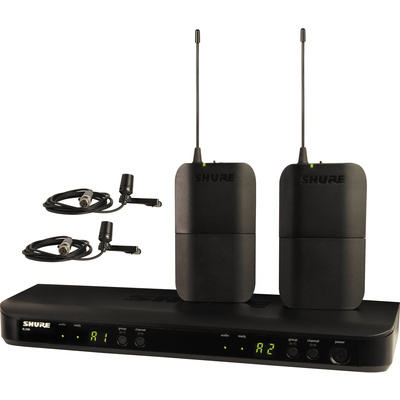 The BLX88 Dual-Channel Wireless Receiver from Shure is a dual-channel receiver set to Shure's M15 frequency band and operates between 662 to 686 MHz. It has microprocessor-controlled internal antenna diversity for reduced signal interference and dropouts. The one-touch QuickScan frequency selection feature allows you to quickly locate the frequency with the least amount of interference available.